Guest writer Ronnie Smith recalls the good old days and recaptures the peace in Cheia, on Romania's Prahova valley. A long time ago, when I was about 12 years old, I would spend the magical time at the end of each summer day (such things did exist in Scotland at one time) sitting on the steps at my front door picking the mud from the studs of my football boots. From my vantage point at the back of the seaside town of Largs, I could watch the sun sink behind the darkening hills of the Cowal peninsula, across the wide firth of the river Clyde. At the same time I could see the high ridge that runs behind Largs fade into a long, craggy, silhouette brought into sharp relief by the strengthening light of the moon. As the heat of the day cooled I could smell that strange mixture of cut grass from our front garden and two-stroke oil from the older boys’ pampered and precious 125 cc motor bikes. I could hear the bounce of a ball 200 meters away, a second and a half after I saw it hitting the road, punctuating the crystal clear conversations of my friends as they played under the street lamp, the occasional dog barking in a far-away street and, from inside the house, my Mum’s voice as she tried to reason with my Gran on the phone. On my skin I could feel the temperature fall and an almost imperceptible breeze rise, pushing the night ahead of it. It was a time of almost perfect peace when my senses could relax and do their jobs properly after a hectic day of exploring hills, playing football, throwing stones to empty bottles at the beach and selling golf balls for chocolate money to the golfers who had probably lost them in the first place. A time of peace that I didn't experience again in my life until I recently visited Cheia. There, in the valley, walking the quiet streets of the village among the pine trees I was able to watch the sun turn the mountains to darkness as it set behind them; with the exception of Babes mountain, looking like Montserrat in Catalunya, whose spectacular geology was illuminated by a full moon. I could smell the mint and pine from the countryside and the beguiling aroma of gratar coming into production in back yards across the village. I could listen, through the clear cooling air, to the voices of conversations between people that I couldn’t see, dogs more than occasionally barking at the moon and even the occasional ball bouncing on gashed and disintegrating tarmac. At some of the pensiunes wedding parties were starting to come to noisy life, but even they couldn’t threaten the general peace and the feeling that, in Cheia, it is possible to witness the rare and proper winding down of the entire world at the end of every day. I will never again dislodge mud from between the studs of my football boots, but I will go back to Cheia. Even getting to Cheia is a rare pleasure as it sits in its lovely valley half-way between Valenii de Munte and Brasov, less than 150 Km from Bucharest. The drive through the mountain passes, in either direction, is unforgettable and the village is a perfect base for exploring the mountainous region and its many historic and natural attractions, hill-walking and road or mountain biking. 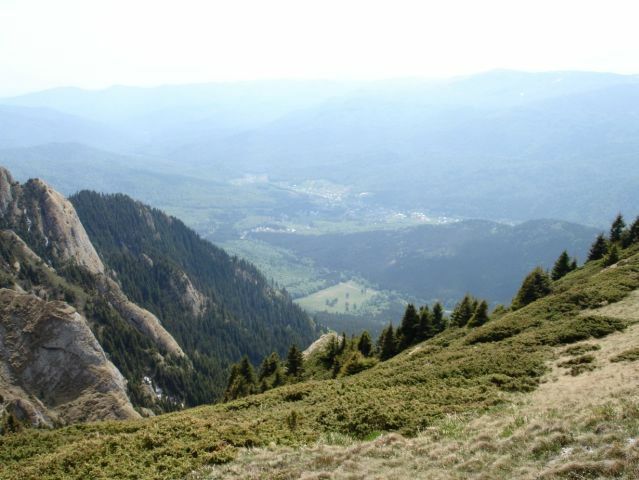 Of course the nearby city of Brasov and also the high altitude Poiana Brasov are both excellent places to visit. Accommodation is reasonably priced and widely available throughout the area and my advice is that if you have a free weekend you should seriously think of spending it in Cheia. But leave room for me.